Sonic Mania was first unveiled during Sonic’s 25th anniversary party at San Diego Comic-Con last year. The event was streamed live for all to see and it was the hottest stream of 2016 (NSFW language in linked video). Sandwiched in between various technical issues and awkward product placements was Sonic Mania’s debut trailer. Admittedly I wasn’t as excited about the project as I could have been—Sega had made previous attempts to bring Sonic back to its 2D glory, with varying levels of success. However, the development of Sonic Mania is quite different. 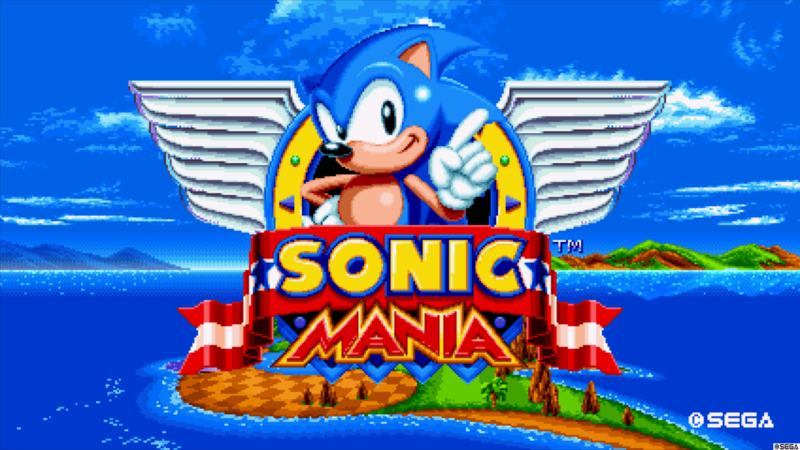 Sonic Mania’s beautiful title screen. I would be remiss to not at least touch on the story behind Sonic Mania, as it’s fairly critical to the game’s quality. It was not developed by Sonic’s usual handlers, namely Sonic Team and Dimps. Instead, development was handed off to prominent figures in the Sonic ROM-hack and fan-game community, the most notable being Christian Whitehead. 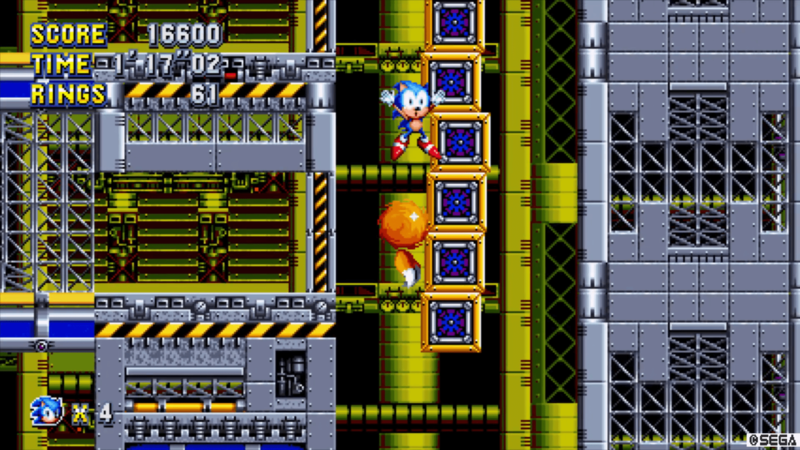 Whitehead had previously worked with Sega on the iOS and Android ports of Sonic the Hedgehog, Sonic CD, and Sonic the Hedgehog 2, which were incredibly well received by fans and are considered to be the gold standard of how to port classic games to mobile platforms. Sonic Mania was clearly a project of the heart for everyone involved, and that only became more apparent as time went on. My lack of enthusiasm for the project was soon replaced by pure glee and Sonic Mania would become one of my most anticipated games of 2017, if not the most. It released on August 15, 2017, and I couldn’t be happier to say that my anticipation was rewarded with what may be the best entry in the entire Sonic the Hedgehog franchise. The developers capitalize on players’ nostalgia right at the outset of Sonic’s adventure. 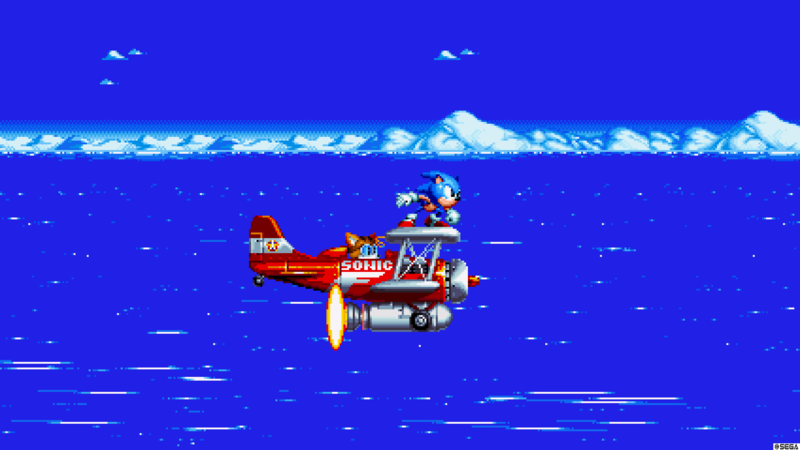 Sonic Mania begins with Sonic and Tails returning to Angel Island after their victory over Dr. Robotnik in Sonic the Hedgehog 3. The scene doubles as both our introduction to Sonic Mania’s new antagonists, the Hard-Boiled Heavies, and the first of many callbacks to previous Sonic titles and other classic Sega properties, including Streets of Rage, Daytona USA, and an obscure Sonic-themed popcorn machine. Even the aforementioned “hottest stream of 2016” gets an audible shout-out at the very end of Studiopolis Act 2. Sonic Mania delivers all of these nostalgia trips without feeling forced or pandering over the course of its 12 zones—four completely new and original zones and eight classic zones from previous Sonic titles. If you’re getting a been-there-done-that feeling about the inclusion of classic zones, well, worry no more. Although Act 1 of each zone stays relatively faithful to its original form, Act 2 is always a fresh take. For example, the final boss of Green Hill Zone is the Death Egg Robot, the final boss from Sonic the Hedgehog 2. And that’s just the beginning of the game—there are plenty of other twists on classic zones that I’d rather not spoil here, as I’d hate to ruin the surprise for Sonic veterans. So, how about the four all-new zones? Well, they’re fantastic. Whether it’s the backstage of a TV set in Studiopolis Zone or the spaghetti-western-influenced Mirage Saloon Zone, they all play, look, and sound on the same level as their classic counterparts. It wouldn’t be a classic Sonic game without the sketchy collision detection. Overall, the presentation of Sonic Mania really feels like the 32-bit Sonic the Hedgehog game that we never got. That classic look and feel has been brought up to date with a 16:9 aspect ratio and support for modern HD resolutions all running at 60 frames per second. The game looks gorgeous, and the animation for Sonic, Tails, and Knuckles is incredibly smooth. So, Sonic Mania looks the part of a classic Sonic game, but does it sound like one? It absolutely does. Tee Lopes, an artist that I’m afraid that I’m not super familiar with outside of Sonic Mania, provides the arrangement of classic tunes, remixes of those classic tunes that accompany Act 2 of each classic zone, and original pieces to accompany the four new zones. Studiopolis Zone Act 1 is a manic upbeat delight befitting of a bust television studio and Mirage Saloon Act 1 sounds exactly as you’d expect from its western aesthetic. Sonic Mania’s OST is an all-timer from start to finish, no doubt about it, but I have to give special recognition to Press Garden Zone Act 1 and Act 2. Either of those two can be my favorite track at any given moment. 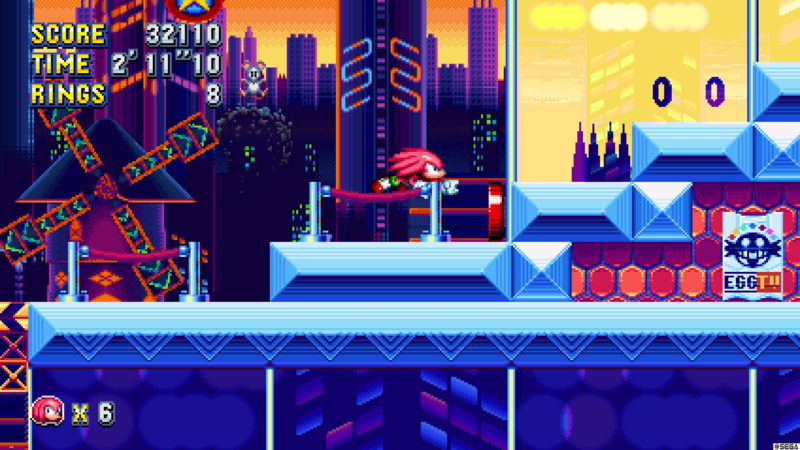 Knuckles makes his return as a playable character with all his signature abilities in tow. But the most important question is, of course, how does it play? Well, just like the presentation, it’s fantastic. The level design of each zone, both new and old, flows smoothly with little interruption, and they are a blast whether you’re casually playing to completion or speeding through each act as quickly as possible. Sonic, Tails, and Knuckles all play as you remember them. Tails can fly, Knuckles can glide and climb walls, and new to Sonic Mania is the Drop Dash ability—by jumping and then holding the jump button while in midair, Sonic will gain a quick burst of speed on landing, keeping him always in motion. It’s a nice addition that sets Sonic apart from his friends, though I rarely used it, and I even forgot about it for most of my first playthrough. All the momentum-based movement and physics from the classic games are present, and Sonic Mania will feel immediately familiar to fans. With the right balance of challenge and playability the special stages in Sonic Mania are the best in the entire series. Returning from Sonic the Hedgehog 3 are the giant rings that act as your gateway to the game’s new special stages and are hidden throughout each zone. These stages play like a mix of Sonic R, Sonic the Hedgehog 3 special stages, and Sonic CD special stages. You’re constantly being propelled forward, collecting blue spheres and rings as you run; the rings act as your time limit, and if you collect enough spheres you’ll eventually gain an increase in speed. The goal is to catch a “UFO” and ultimately obtain one of seven Chaos Emeralds. As always, collecting all seven Chaos Emeralds will unlock a secret final boss and an extended “true” ending upon completion. Blue Sphere from Sonic the Hedgehog 3 also makes a comeback, except in Sonic Mania it acts as a bonus stage. This is where my only real gripe with Sonic Mania’s level design resides. 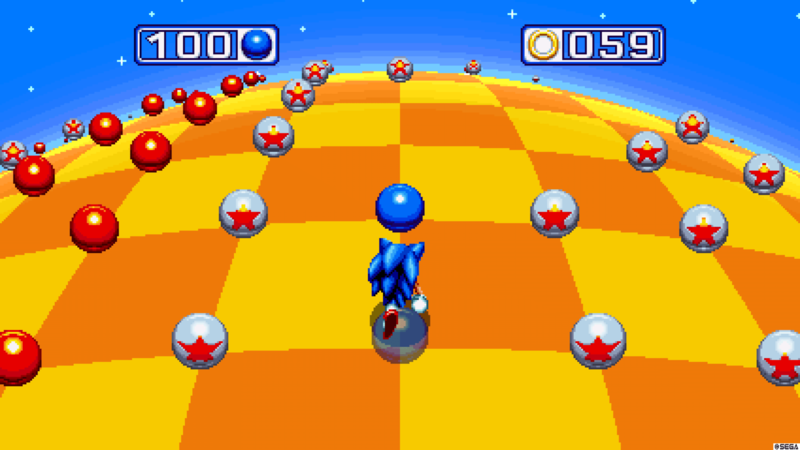 You trigger Blue Sphere by passing a checkpoint while carrying 25 or more rings. There are a lot of checkpoints and consequently a lot of Blue Sphere courses in Sonic Mania; Blue Sphere occurs far too frequently and lasts for too long each time. It’s the only thing that breaks Sonic Mania’s otherwise constant flow. 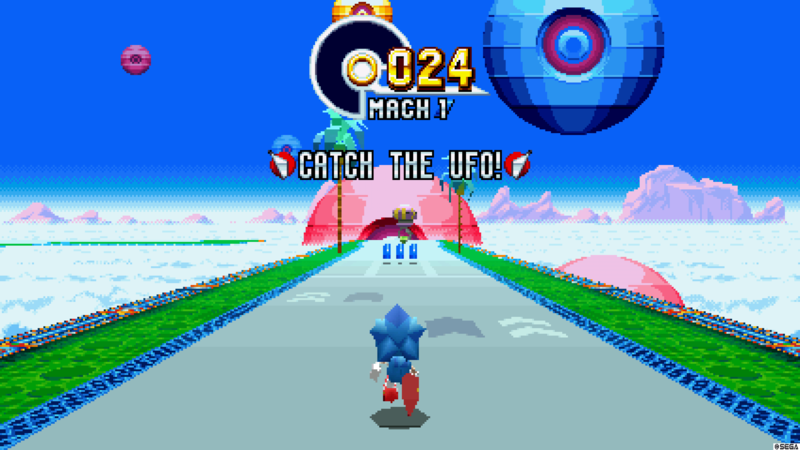 Granted, Blue Sphere is entirely optional, but completing courses normally or with a “perfect” rating (obtained by collecting all rings in a course) eventually unlocks various fun options, like Sonic’s abilities from previous games and a laugh-worthy “& Knuckles” mode that allows Knuckles to tag along with any character of your choice—even Knuckles. Unlike previous games, there’s now a boss at the end of each act, and they range from the creative, like the boss in Chemical Plant Act 2 (which I won’t spoil), to a robot that just kind of floats around a tosses wrenches at you. The often-weak bosses and the constant threat of having to play Blue Sphere are weak points for sure, but they do little to damage the whole. Blue Sphere is a nice indulgence, but it brings the otherwise fantastic level design to a full stop. Sonic Mania sets a new standard for how to bring classic franchises back to life. By taking the core features that made its predecessors so beloved and bringing the presentation up to modern standards, it is the example to follow. But can this work again? Sure, there are more classic zones to adapt, but it wouldn’t have the same feel the second time around. That said, the original zones are of such quality that I would happily pay for a Sonic Mania 2 consisting of all new content. I had a hard time putting down Sonic Mania as I finished writing this review. Everything about it perfectly encapsulates what made the classic series so good, and why Sonic the Hedgehog 3 is an all timer for me. The level design, controls, music, pacing—all of it comes together and doesn’t just make a good Sonic game, but an excellent platformer. Anyone can find something to enjoy in Sonic Mania regardless of their level of affinity for the blue hedgehog. The year is 2017 and a Sonic the Hedgehog game may very well be a top-three game of the year for me. Huh.